The Commonwealth of Massachusetts does not require bicyclists over the age of 16 to don a helmet when they take to the streets. Furthermore, the law is very clear that lack of a helmet on an injured rider is not grounds to find contributory negligence (see M.G.L. ch. 85, section 11B). That said, it’s generally a very good idea for all bicyclists to wear a helmet. We know that more head injuries occur in biking than in any other sport. A bike helmet may not prevent a bicycle accident, but it can help to significantly reduce injuries and protect riders against concussions and traumatic brain injury. There were reportedly 287,0000 bike-related head injuries in the U.S. between 2007 to 2011. By comparison, there were 220,000 head injuries attributed to football and 132,000 to basketball. Recently, Consumer Reports touched on this in two different articles. The first involved finding the best bicycle helmet and the second involved analyzing the anatomy of a bicycle accident and how helmets can help play a role in reducing injuries. 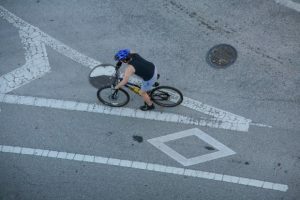 In looking at how bicycle accidents are caused – and how helmets can help – researchers noted that in almost all cases, the bike stops suddenly because it has struck a solid object, be it a car or or rock or some other impediment. At that point, the rider continues to move even though the bicycle is still in motion. Sometimes, the rider flies over the handlebars. In other cases, the rider simply falls down to the ground sideways. The average human skull, when not protected, can usually withstand some modest impacts. For example, if you fall while running, your head will probably recover. However, when you fall or are thrown off a bicycle, the force involved is usually much greater. Riders are generally moving at average speeds of between 10 and 14 mph. When the rider is wearing a helmet, that outer shell can help prevent minor punctures from sharp objects, such as rocks and branches. It also allows the head to glide as it’s moving, which can help to stop severe wrenching of the head and neck. The rider might still suffer a concussion in that scenario, but the chances of a traumatic brain injury are greatly reduced. The Insurance Institute for Highway Safety reports that 6 in 10 people who suffered fatal injuries in a bicycle accident weren’t wearing a helmet. Again, that won’t reduce a victim’s chances of obtaining compensation for those injuries, but it’s always better to take steps to reduce the severity of an injury if at all possible. In terms of finding the best helmet, it’s worth noting that bicycle helmet safety is improving. Although designs went largely unchanged for decades, an increasing number of manufacturers are tweaking their models specifically to help prevent concussions. Bike helmets need to be well-designed and fit properly. Consumer Reports has rated a series of helmets by dropping them at various speeds against a myriad of surfaces to see the kind of force they can withstand. Helmets need to fit snugly, the front should be situated no more than two finger widths above the brow, straps should form a “V” under each ear and the buckle should fit underneath one’s head. Bear in mind that straps can shift over time and head sizes and shapes vary, so riders should be willing to try several models to see which one fits best.